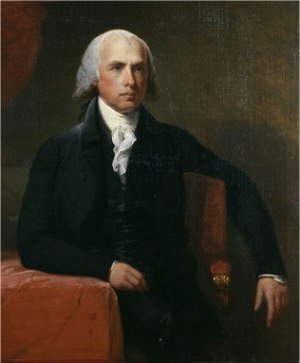 James Madison was born in Virginia. He had eleven younger brothers and sisters. He was sick a lot when he was a child and the family hired a private tutor* to teach him until he was 11. Then he went to a boarding school which was 70 miles from his home. There he spent five years studying Latin, Greek, French, Italian, algebra,* geometry,* and geography. When he was 18 he entered college. He studied hard and finished college in two years instead of three. After he graduated, he didn't know what he wanted to do. He could go back to the family plantation and farm, or he could become a minister. He thought about becoming a lawyer. He would just keep studying. He decided to help in the government. He served in the Continental Congress. 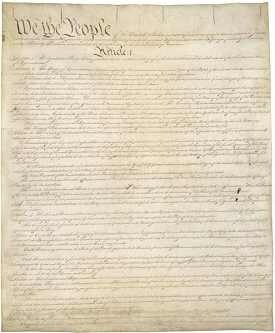 Some say that without James Madison, the Constitution* would not have been written. He is called the Father of the Constitution. He had studied a lot and taken a lot of notes. When the men met to talk about a constitution, Madison spoke 161 times. He knew about every subject being discussed. He was elected president in 1809. His wife Dolley enjoyed entertaining in the White House. It is said she had a smile and a pleasant word for everyone. After he retired from being the president, he and Dolley returned to Montpelier, the family estate. He died there in 1836. His wife then returned to Washington and lived there for the last 13 years of her life. 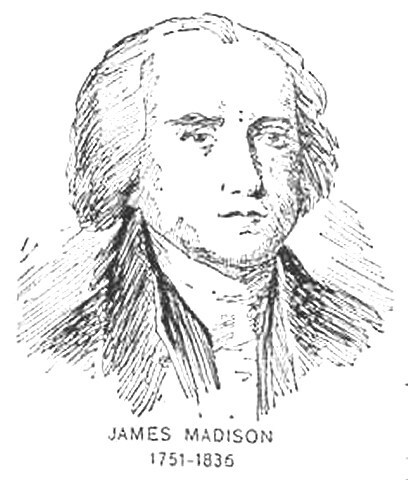 Press "Go" to search for books about James Madison. This page displayed 122,742 times.